It is the stage of fully development of tissue of fruit and vegetables only after which it will ripen normally. During the process of maturation the fruit receives a regular supply of food material from the plant. When mature, the abscission or corky layer which forms at the stern end stops this inflow. Afterwards, the fruit depend on its own reserves, carbohydrates are dehydrated and sugars accumulate until the sugar acid ratio form. In addition to this, typical flavour and characteristic colour also develop. it has been determined that the stage of maturity at the time of picking influence the storage life and quality of fruit, when picked immature like mango develop white patches or air pockets during ripening and lacking in normal brix acid ratio or sugar acid ratio, taste and flavour on the other hand if the fruits are harvested over mature or full ripe they are easy susceptible to microbial and physiological spoilage and their storage life is considerably reduce. Such fruits persist numerous problems during handling, storage and transportation. Therefore, it is necessary or essential to pick up the fruits or vegetables at correct stage of maturity to facilitate proper ripening, distant transportation and maximum storage life. It is a developmental stage of the fruit on the tree, which will result in a satisfactory product after harvest. It refers to the stage in the development of the fruits and vegetables when maximum growth and maturation has occurred. It is usually associated with full ripening in the fruits. The Physiological mature stage is followed by senescence. It is the state of plant organ required by a market. It commonly bears little relation to Physiological maturity and may occur at any stage during development stage. It may be defined in terms of Physiological maturity and horticultural maturity, it is a stage, which will allow fruits / vegetables at its peak condition when it reaches to the consumers and develop acceptable flavour or appearance and having adequate shelf life. Olive green colour with clear lenticels, shoulder development size sp. gravity, days from fruit set. Skin colour, drying of leaves of the plant, brittleness of floral ends, angularity of the fruit, and days from emergence of inflorescence. Vegetables are harvested at harvest maturity stage, which will allow it to be at its peak condition when it reaches the consumer, it should be at a maturity that allows the produce to develop an acceptable flavour or appearance, it should be at a size required by the market, and should have an adequate shelf life. Time taken from pollination to horticultural maturity under warm condition, skin colour, shape, size and flavour and abscission and firmness are used to assess the maturity of the produce. Loss of green colour in citrus and red colour in tomato. Sweet corn is harvested at immature stage, smaller cobs marketed as baby corn. Okra and cow pea are harvested at mature stage (pre fiber stage). In chilli, bottle gourd, bitter gourd, cluster beans maturity is related to their size. Cabbage head and cauliflower curd are harvested before un pleasant flavour. Musk melon should be harvested at the formation of abscission layer. In cabbage and lettuce should be harvested at firmness stage. 1. Temperature: Higher temperature gives early maturity. e.g. Gulabi (Pink) grapes mature in 100 days in Western India but only 82 days are enough in the warmer Northern India. Lemon and guava takes less time to mature in summer than in winter. Sun-scorched portions of fruits are characterized by chlorophyll loss, yellowing, disappearance of starch and other alcohol insoluble material, increase in TSS content, decrease in acidity and softening. 2. Soil: Soil on which the fruit tree is grown affects the time of maturity. e.g. Grapes are harvested earlier on light sandy soils than on heavy clays. 3. Size of planting material: This factor in propagated fruits affects fruit maturity. e.g. In pineapple, the number of days taken from flowering to fruit maturity was more by planting large suckers and slips than by smaller ones. 4. Closer spacing: Close spacing of hill bananas hastened maturity. 5. Pruning intensity: It enhanced the maturity of Flordasun and sharbati Peaches. It is most convenient index. Certain signals on the plant or on the fruit can be used as pointers. E.g. drying of top leaves in banana, yellowing of last leaf of Peduncle in jackfruit. Flow of sap from cut fruit stalk of mango slows down if the harvest is done after maturity but in immature fruits, exudation is more and comes with force in a jet form. in papaya, the latex becomes almost watery. The flow gets reduced on maturity in Sapota. In fruits like banana and Sapota, floral ends become more brittle and shed with a gentle touch or even on their own. In Sapota, the brown scurf on the fruit skin starts propping. In mango, lenticels become more prominent and the waxy bloom gradually disappears. Grapes develop translucent bloom. Other changes like angularity in banana, development of creamy wide space between custard apple segments and the flattening of the eyes in pineapple and tubercles in litchi serve as reliable maturity indices. 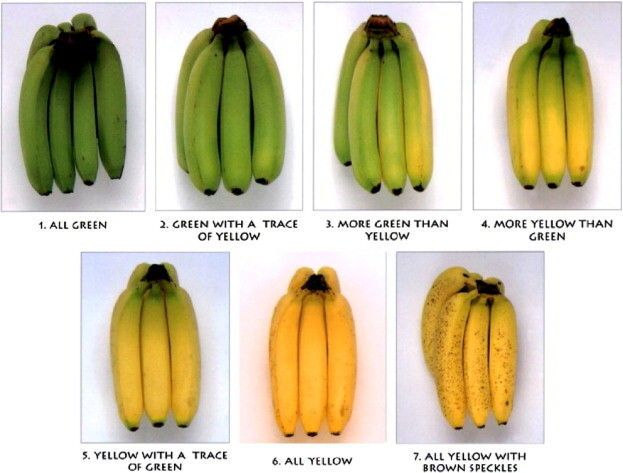 It can also be used as an index of fruit maturity, e.g. endocarp hardening for stone and fiber development for dessert in mango. 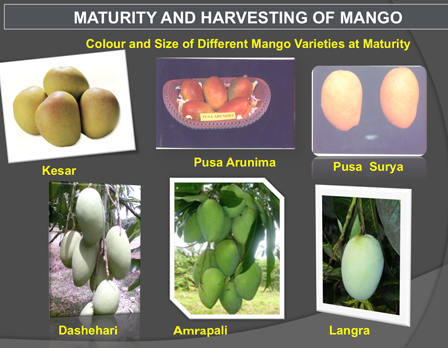 Occasionally it can be used as an index of fruit maturity in mango. For perennial fruit crops grown in seasonal climate which are more or less uniform from year to year, calendar date for harvest is a reliable guide to commercial maturity. This approach relies on a reproducible date for the time of the flowering and a relative constant growth period from flowering through to maturity. Time of flowering is largely dependent on temperature, and the variation in number of days from flowering to harvest can be calculated for some commodities by use of the degree- concept. Harvest date of newly introduced fruits in a widely varying climate can be predicted with the help of heat unit. For each cultivar the heat requirement for fruit growth and development can be calculated in terms of degree days: Maturity at higher temperature is faster as the heat requirement is met earlier. This heat unit helps in planning, planting, harvesting and factory programmes for crops such as corn, peas and tomato for processing. The fruit is harvested when the ridges on the surface of skin change from angularity to round i.e. after the attainment of 3% full stages. Dwarf banana are ready for harvest within 11-14 months after planting while tall cultivars takes about 14-16 months to harvest. Peel colour change from dark green to light green the remaining style ends were dry, and brittle and fruits were less angular in shape. TSS acid ratio, specific gravity and colour are determined the maturity in guava. For e.g. Colour - Light green to yellow. Sugar percentage should be 12-16% and acid percentage 1.5—2.5%, variety Ganesh harvest when seed colour becomes pink. In this stage TSS 12.5% and sugar acid ratio 19.5%. It takes one year for fruiting after flowering. It is the fruit which ripen after one year of flowering. April start harvesting and may end it start in flowering. This can be judged when one or two mangoes ripen on the tree are fall on the ground of their own accord. This process of fallen is known as tapaca specific gravity 1,01—1.02 and TSS 10-14%. Well filled pods that are beginning to lose their greenness. Easily separated from vine with a slight twist leaving clean cavity (full slip stage). The goals of harvesting are to gather a commodity from the field at the proper level of maturity with a minimum of damage and loss, as rapidly as possible and at a minimum cost. This is achieved through hand-harvesting in most fruit, vegetable and flower crops. Hand harvesting has a number of advantages over machine harvest. People can accurately determine product quality, allowing accurate selection of mature product. This is particularly important for crops that have a wide range of maturity and need to be harvested several times during the season. Properly trained workers can pick and handle the product with a minimum of damage. Many fresh-market products have a short shelf life if they are bruised or damaged during harvest and handling. The rate of harvest can easily be increased by hiring more workers. Hand- harvesting also requires a minimum of capital investment. The main problem with hand harvesting is labor management. Labor supply is a problem for growers who cannot offer a long employment season. Labor strikes during the harvest period can be costly. In spite of these problems, quality is so important to marketing fresh- market commodities successfully that hand harvesting remains the dominant method of harvest of most fruits and vegetables and for all cut flowers. Effective use of hand labor requires careful management. New employees must be trained to harvest the product at the required quality and at an acceptable rate of productivity. Employees must know what level of performance and must be encouraged and trained to reach that level. Mechanical harvest is currently used for fresh-market crops that are roots, tubers, or rhizomes and for nut crops. Vegetables that are grown below ground (radishes, potatoes, garlic, carrots, beets and others) are always harvested only once and the soil can be used to cushion the product from machine caused mechanical injury. Tree nuts and peanuts are protected by a shell and easily withstand mechanical handling. A number of products destined for processing such as tomatoes, wine grapes, beans, peas, prunes, peachesand some leafy green vegetables are machine harvested because harvest damage does not significantly affect the quality of processed product. This is often because the product is processed quickly after harvest. These crops have also been amenable to new production techniques and breeding that allow the crop to be better suited to mechanical harvest. The main advantage of mechanical harvest equipment is that machines can often harvest at high rates. Tree nut harvesters, for eg. attaching a shaking mechanism to the tree and remove most of the nuts in few seconds. The nuts are either caught on a fabric- covered frame or picked up from the ground by other machines. This allows an orchard to be harvested very quickly compared to handshaking with poles. Machine harvest also reduces management problems associated with workers. The commodity must be grown to accept mechanical harvest. Machines are rarely capable of selective harvest. Mechanical harvesting will not be feasible until the crop or production techniques can be modified to allow one time harvest. Harvesting machines often causes excessive product perennial crops eg. Bark damage from a tree shaker. The harvesting machines are quite expensive. Being living organs, fruits and vegetables continue to respire even after harvesting when they have a limited source of food reserves. In addition to degradation of respiratory substrates, a number of changes in taste, colour, flavour, texture and appearance take place in the harvested commodities which make them unacceptable for consumption by the consumers if these are not handled properly. Post harvest technology starts immediately after the harvest of fruits and vegetables. The whole process of processing the commodities is categorized as Handling of fresh produce. Post harvest Technology of fresh fruits and vegetables combines the biological and environmental factors in the process of value addition of a commodity. Precooling (prompt cooling after harvest) is important for most of the fruits and vegetables because they may deteriorate as much in 1 hr at 32°C. In addition to removal of field heat from commodities, precooling also reduces bruise damage from vibration during transit. Cooling requirement for a crop vary with the air temperature during harvesting, stage of maturity and nature of crop. There are many methods of precooling viz, cold air (room cooling, forced air cooling), cold water (hydrocooling), direct contact with ice (contact icing), evaporation of water from the produce (evaporative cooling, vacuum cooling) and combination of vacuum and hydrocooling (hydrovac cooling). Some chemicals (nutrients/growth regulators/ fungicides) can also be mixed with the water used in hydrocooling to prolong the shelf life by improving nutrient status of crop and preventing the spread of post harvest diseases. Before fresh fruits and vegetables are marketed various amounts of cleaning are necessary which typically involves the removal of soil dust, adhering debris, insects and spray residues. Chlorine in fresh water is often used as disinfectant to wash the commodity. Some fungicides like Diphenylamine (0.1 - 0.25%) or ethoxyquin (0.2 - 0.5%) may be used as post harvest dip to control the disorders. Eg. Apple superficial scald. For cleaning of some fruit type vegetables (melons, brinjals, tomatoes, cucumber) they should be wiped with damp cloth. Many vegetable need trimming, cutting and removal of unsightly leaves or other vegetative parts. Sorting is done by hand to remove the fruits which are unsuitable to market or storage due to damage by insects, diseases or mechanical injuries. The remainder crop product is separated into two or more grades on the basis of the surface colour, shape or visible defects. For eg, in an apple packing house in India 3 grades viz. Extra Fancy, Fancy and standard may be packed for marketing. The fourth “cull” grade is meant for processing. After sorting and grading, sizing is done either by hand or machine. Machine sizers work on two basic principles: weight and diameter. Sizing on the basis of fruit shape and size are most effective for spherical (Oranges, tomato, certain apple cultivars) and elongated (Delicious apples and European pears or of non-uniform shape) commodities, respectively. Curing is an effective operation to reduce the water loss during storage from hardy vegetables viz, onion, garlic, sweet potato and other tropical root vegetables. The curing methods employed for root crops are entirely different than that from the bulbous crops (onions and garlic). The curing of root and tuber crops develops periderms over cut, broken or skinned surfaces wound restoration. It helps in the healing of harvest injuries, reduces loss of water and prevents the infection by decay pathogens. Onions and garlic are cured to dry the necks and outer scales. For the curing of onion and garlic, the bulbs are left in the field after harvesting under shade for a few days until the green tops, outer skins and roots are fully dried. Quality retention is a major consideration in modem fresh fruit marketing system. Waxes are esters of higher fatty acid with monohydric alcohols and hydrocarbons and some free fatty acids. But coating applied to the surface of fruit is commonly called waxes whether or not any component is actually a wax. Waxing generally reduces the respiration and transpiration rates, but other chemicals such as fungicides, growth regulators, preservative can also be incorporated specially for reducing microbial spoilage, sprout inhibition etc. However, it should be remembered that waxing does not improve the quality of any inferior horticulture product but it can be a beneficial adjunct to good handling. ­- Improved appearances of fruit. - Reduced moisture losses and retards wilting and shrivelling during storage of fruits. - Less spoilage specially due to chilling injury and browning. - Creates diffusion barrier as a result of which it reduces the availability of 02 to the tissues thereby reducing respiration rate. - Protects fruits from micro-biological infection. - Considered a cost effective substitute in the reduction of spoilage when refrigerated storage is unaffordable. - Wax coating are used as carriers for sprout inhibitors, growth regulators and preservatives. The principal disadvantage of wax coating is the development of off- flavour if not applied properly. Adverse flavour changes have been attributed to inhibition of O2 and CO2 exchange thus, resulting in anaerobic respiration and elevated ethanol and acetaldehyde contents. Paraffm wax, Carnauba wax, Bee wax, Shellac, Wood resins and Polyethylene waxes used commercially. Proper or scientific packaging of fresh fruits and vegetables reduces the wastage of commodities by protecting them from mechanical damage, pilferage, dirt, moisture loss and other undesirable physiological changes and pathological deterioration during the course of storage, transportation and subsequent marketing. For providing, uniform quality to packed produce, the commodity should be carefully supervised and sorted prior to packaging. Packaging cannot improve the quality but it certainly helps in maintaining it as it protects produce against the hazards of journey. Striking developments have been in the field of packaging of horticultural produce and the gunny bags, grasses and stem leaves used so far for packaging are now being replaced by a variety of containers such as wooden boxes, baskets woven from bamboo or twigs, sack/jute bags and corrugated fibre board (CFB) boxes. A number of storage techniques (ground storage, ambient storage, refrigerated storage, air cooled storage, zero energy storage, modified atmospheric storage, hypobaric storage and controlled atmosphere storage) are being used for fruits and vegetables depending upon the nature of the commodity and the storage period intended.